Twenty 4 3/4 x 6 3/4" blank notecards (five each of four styles) with white envelopes in a decorative box. Using basic draftsman's tools--square, triangles, compass--Frank Lloyd Wright created dazzling, highly abstract works of art applied to windows, lamps, rugs, mosaics, and furniture. Like his mentor, Louis Sullivan, Wright believed in ornamentation that was integral to a building's design (as opposed to applied decoration). His work was often so far ahead of its time that it failed to win the respect it deserved from the contemporary mainstream. In hindsight, Wright's remarkable architectural and interior details form a logical, natural step on the path to purely abstract graphic designs, such as those adapted for these notecards. Wright's integral ornamentation combines a draftsman's technical mastery with the fluid imagination of a musician to form dazzling variations on elegantly simple themes. 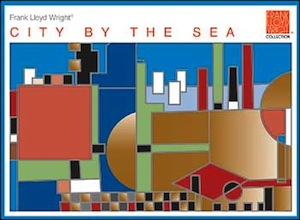 This notecard set celebrates Frank Lloyd Wright's 1956 mural design, City by the Sea, for the Music Pavilion at Taliesin West, Scottsdale, Arizona.